A body has been found in a canal in Cardiff city centre. 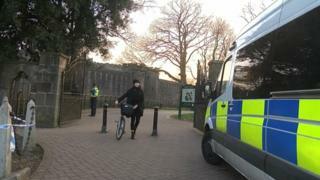 Police were called at 13:15 GMT on Sunday following the discovery in water in Bute Park behind Cardiff castle. South Wales Fire & Rescue Service assisted retrieving the body, which has yet to be formally identified, close to North Road. South Wales Police are appealing for information, but said it is not treating the incident as suspicious at this stage.